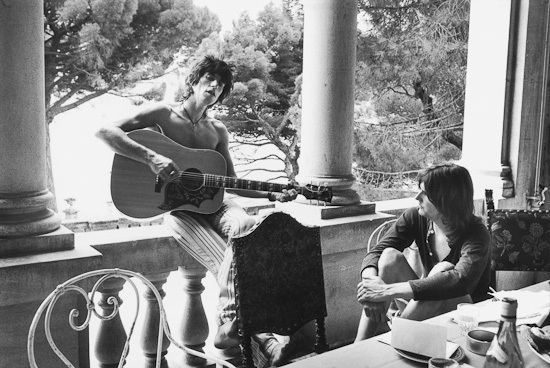 At the tail end of their 1969 U.S. tour, Mick Jagger, 26, says to Stanley Booth: “Got to think about the future because obviously I can’t do this forever. I mean we’re so old.” It didn’t quite work out that way, as now we know. Photograph © Dominique Tarle. All rights reserved. Dominique Tarle is the photographer who shows up at Nellcote for one day and then, as he announces he must get back to Paris, is told to stick around, his room is ready. He stays for months, an experience I could relate to. 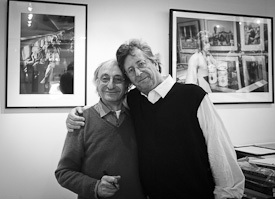 Dominique was passionate about taking pictures of musicians, had gone to London to do just that in 1968. 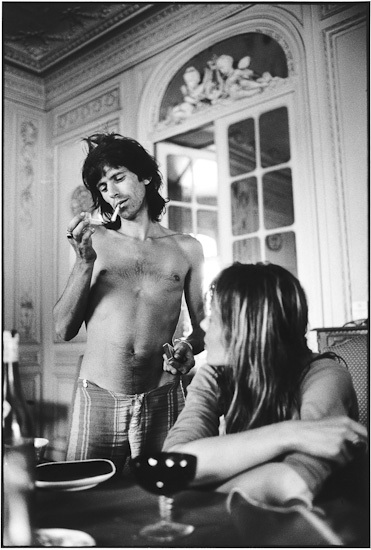 But it was his presence at Nellcote that would produce some of the most extraordinary photographs of the Rolling Stones ever taken. His pictures are a visual feast. If they were a meal you might feel like you stumbled into the world’s best, most exotic, restaurant. Dominique shoots in the opulence of the South of France, in a villa (Nellcote) commandeered by the Nazis in the Second World War. Now it is inhabited by Rock’s Renegades. (In this juxtaposed fantasia one wonders how the Rolling Stones’ existence might have fit in with Hitler’s Master Race? It’s nice to think he would have expired of apoplexy.) 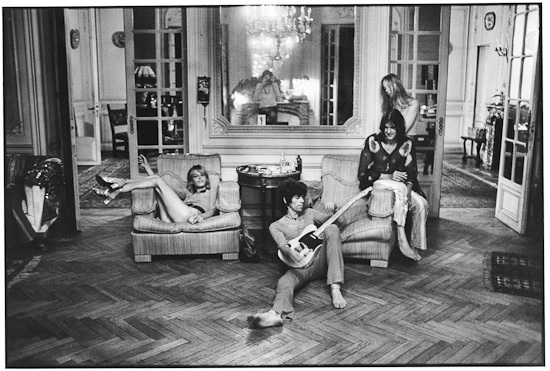 The overwhelming presence in Dominiques’ photographs is Keith Richards, who manages to demand focus without apparently asking for it. 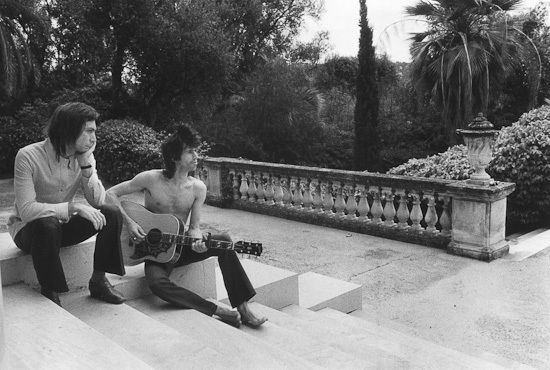 As for the Rolling Stones, they might have wondered (with Jim Morrison) how they were going to get out alive. But they did escape, bringing into this world more remarkable music. At the end, grabbing a box of tapes, they fly to Los Angeles to master the album and begin preparations for the 1972 U.S tour. I would join them there. It is this piece of rock history and experience that is captured in the current show “Soul Survivors” at La Galerie de L’Instant in Paris. The idea for this show — to combine Dominique’s extraordinary images of the making of Exile with my photography from the 1972 tour — came from Julia Gragnon, the gallery’s energetic and passionate owner. and the daughter of Paris Match photographer Francois Gragnon. I flew to Paris for the opening and, while in France, went with Dominique and Julia to Cannes for the screening of Stones in Exile the documentary the Rolling Stones made of the very same period (and which relies on, among other things, both Dominique’s and my photos). The film was enlightening for me. 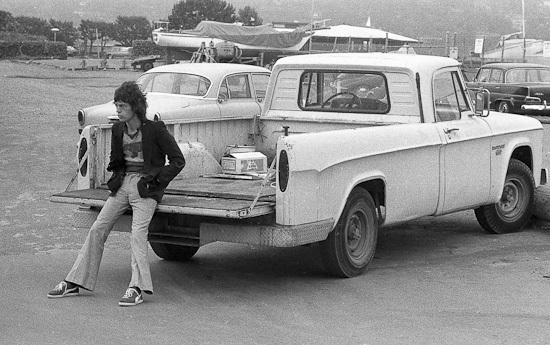 I left the Rolling Stones behind after Altamont and joined them again in 1972. I was aware of their intervening time in France but had little detail. 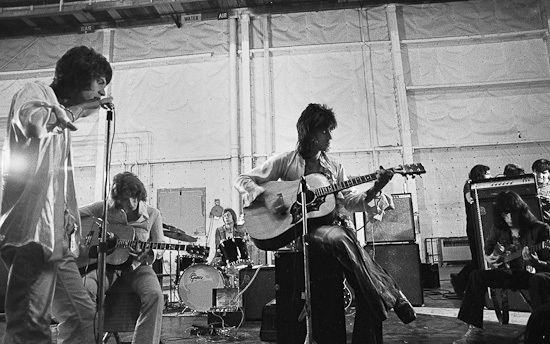 Now years later it was revealed in continuity, and, in the case of the documentary, with interviews with Mick, Keith and Charlie (and Dominique). For me (who knew the Rolling Stones well in England and was an ex-English resident myself) the film brought into sharp relief the wrenching experience that the move to France thrust upon them. The English and the French can be oil and water. I once stood on a hillside in the Dordogne overlooking a small valley. Not a mile across from where I was standing I could see on one side the English castle and on the other the French. Here the French and the English fought each other for One Hundred Years. In the film you see the culture shock in wonderfully small details. As most of us are aware the English palette can be, well, insular, but Charlie Watts’ request for Marmite (a yeast extract the English put on toast) to be shipped to the South of France I found surprisingly poignant. It is, as we all know, the little things. I believe this experience forced the Rolling Stones to become international players. If you can’t go home again, you better learn how to live off the land. 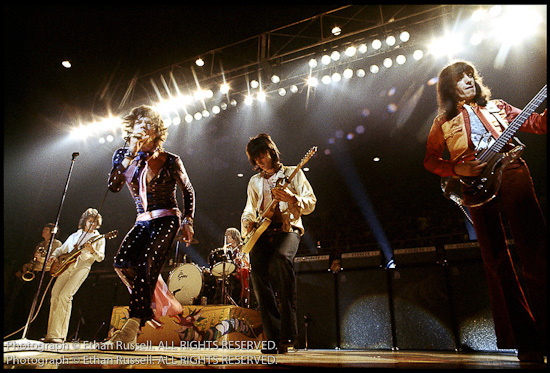 The film — without harping on it — made me acutely aware, in a way that I had not been, the challenge that the Rolling Stones surmounted. As Mick says in the film “We had no money. None.” The Rolling Stones could so easily NOT have made it. Since they were teens they had been careening around the world at a breakneck pace, been confronted by a hostile establishment in England intent on making an example of them. One of them had died. And an American manager had locked up all their money. With all of it, they were just English lads. How could they not be? Over and over again in their career, a much more likely outcome would have been that the Rolling Stones would fail, and it would be brutal. Here’s a title for them: True Grit. Outta the way, John. Photograph © Ethan Russell. All rights reserved. At the Galerie you can see this. Dominique and I share something. (I have talked with him about this, and I think his intentions were more conscious. Maybe it is just the French are more articulate.) What we both did was take pictures that showed it like it was. To this day — especially this day — I get irritated with photographs that scream (the photographer’s head peaking out from behind) “Look At Me! Look at Me!” The value I believe that both Dominque and I were lucky enough to deliver is the experience of letting the viewer be there. The exhibition brings our photographs together in a narrative that neither Dominique nor I could tell by ourselves. 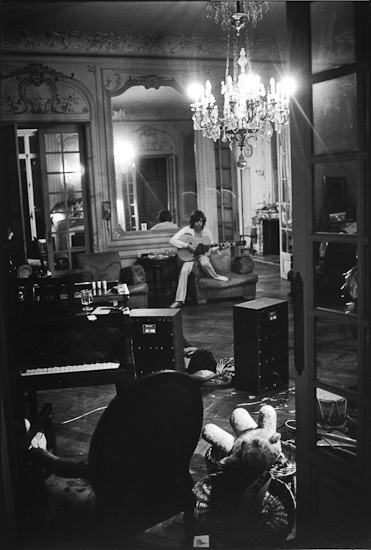 In Dominique’s case it is told through the image of Keith lounging in the echoing rooms of Nellcote. Of Bobby Keys and Jim Price in the basement rooms. Drug Times, Good Times, Exhaustion and Smiling in the Sun. 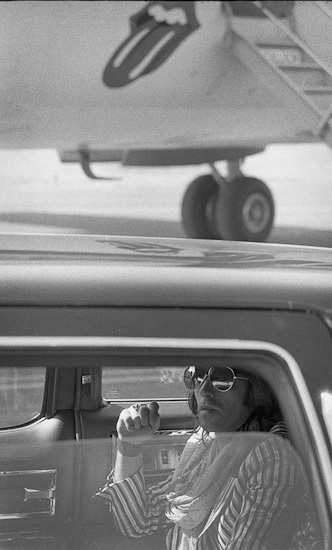 And then, in an image of mine, Keith Richards sits shuttered, behind sunglasses, in the back of a limo (it almost looks armored) with the Stones’ first airplane behind him, emblazoned with a their new logo, the lapping tongue. 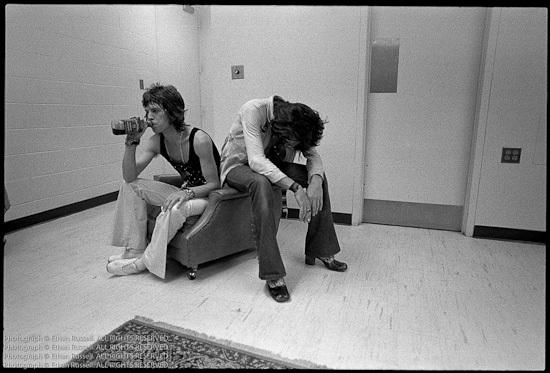 And finally shots of them backstage and onstage: Mick howling, Keith pumping, lights arcing behind them, bringing it to the folks. The viewer is able to be with them from the intimacy of the creative to the launch on the road. This experience, this template, is something the Rolling Stones have done their entire careers. Amid the chaos, it is the architecture within which they live their lives. “Soul Survivors” is a remarkable look at one slice of that. Catch it if you can. In Paris. Closes October 20, 2010. Dominique Tarle and Ethan Russell Paris, 2010.